The rural population of Suffolk is increasingly dividing into the haves and have-nots: those WITH transport – and those without any. 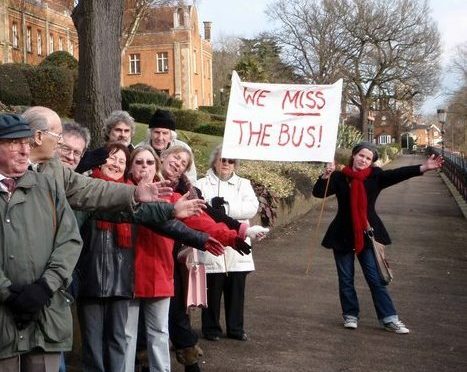 to try and change some of the decisions to reduce bus services at a local level – specifically by asking Go Ahead (new owners of Anglian Buses) if they could reconsider their decision to cut. to use her voice to alter – at national level – the ridiculous ethos of so-called competition which has caused deregulated buses to provide such a terrible service in the countryside. to press the government to address the situation of local transport in the forthcoming spending review holistically, by recognising the additional expense in social care and welfare payments that will occur if public transport is not supported. to press the government to look at the frankly unfair differentials in per capita spending on public transport across the country. Each Londoner gets about three times as much spent on them as each person in Suffolk despite the huge economies of scale London offers – and London buses aren’t deregulated. Why should the rural population be worth any less? I wrote this letter because I’ve been contacted by a so many people living along the path of the soon-to-be-cancelled Anglian bus routes 164 and 165 (164 Saxmundham -Wickham Market-Woodbridge – Ipswich ending at Railway Station. 165:Aldeburgh, Leiston, Rendlesham, Woodbridge, Ipswich ending at Railways station). I am known to be particularly concerned about the public transport situation in Suffolk but I am assuming that Dr Coffey and various relevant council colleagues will have also been approached. These two services are greatly loved and regularly used by many different local people (including myself). They are being cancelled because they are not profit-making. Indeed, how can they be when First bus company has been scheduling similar but by no means identical 64/65 services to run in direct competition? This has been a no-win situation as bus companies and travellers have all lost out. At the same time the First 63 service from Ipswich to Framlingham has been cut back so as to provide a 3-4 bus service only Monday to Friday (no holidays). For the rest of the time , Framlingham and its famous castle is as cut off from Woodbridge and tourism as if it were in Ulan Bataar – a fantastical situation for ‘the greenest county’ to countenance. Basically this means that the five major bus services that up till May 2013 ran through Woodbridge – the second largest town in Dr Coffey’s constituency – have been halved at a stroke. The loss of these buses will have a dreadful impact on bus users all the way down Suffolk Coastal from Leiston to Woodbridge. Research from the Suffolk Foundation a year or two back has told us that 1 in 5 families in Suffolk don’t have a car. The County council response to this over the years has been to replace scheduled services with so-called Demand Responsive Transport. This is a misnomer as it doesn’t respond in any sense to actual demand, or indeed need. It will continue the negative effect on tourism caused by the current (in my opinion crackbrained) transport system which sees would-be visitors to Suffolk stymied by a double whammy of a rail company (Greater Anglia) that only performs engineering works at weekends and public holidays – and a rural bus service that has stopped all services at these times. Again, Demand Responsive transport is of little help in this case because the tourist has to know about it in advance and know where they will be to pick it up, and understand the booking system. Never was there a service less fit for purpose! We need our county council to do more to subsidise scheduled services – and i have copied this letter to the new Cabinet member for Transport, asking him to look at this. But we need more – we need all our elected representatives at all levels of government to join together to improve the status of public transport in Suffolk – indeed in all rural areas. We fail to do so at our peril. Many thanks for your update above about transport issues in the local area, and the problems they are causing local people across the county. We here at the Family Carers Partnership Board http://www.suffolkfamilycarers.org/index.php/get-involved/have-your-say/family-carers-partnership-board are raising transport concerns for Family Carers of all ages so would be really keen to here the response you may receive from your county council colleagues. As you are most aware Caroline, many family carers have to travel to support and care for the person they look after and this can in some situations means one or two buses per trip – if these reductions remain in place they will affect peoples quality of life. I live in a rural area called Old Newton , nr Stowmarket and they are are from Monday cut are bus to two buses only 7.29am and 1.00pm and no buses on a Saturday at all.I have got in touch with my MP and I am still waiting to hear from him.We have a small community and alot of the community is old people.Can you tell me what to do now.